The pupillary axis is an axis of importance, as it serves to define several angles. The pupillary axis is defined as the line that joints the center of the entrance pupil to a point located at the anterior corneal surface, where the local tangent is perpendicular to it. 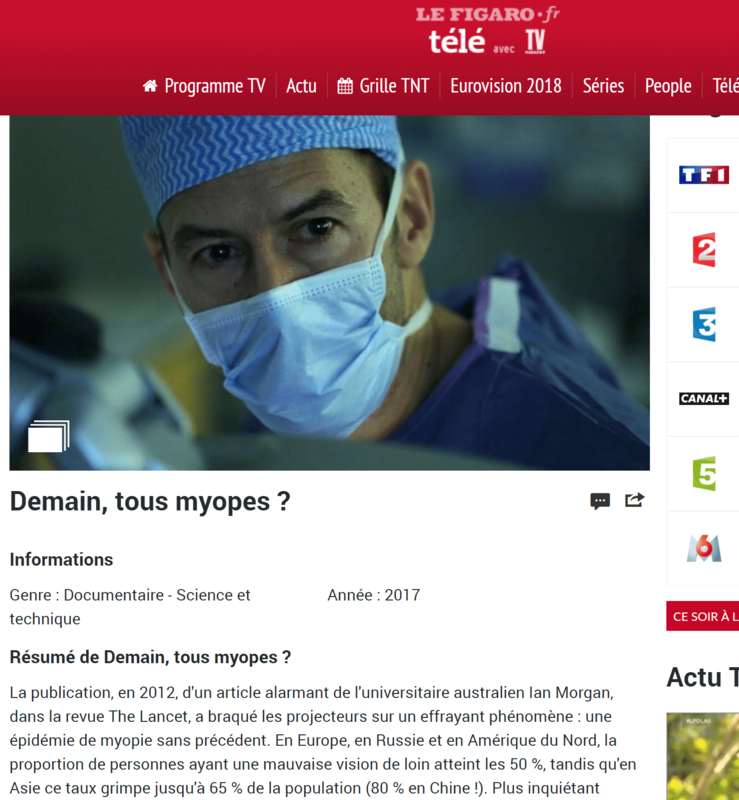 If the corneal was a perfect spherical dome aligned with the physical iris opening (iris pupil), there would not be a « unique » pupillary axis. Representation of the pupillary axis. It can be identified as the axis where a the reflexion of a point light source observed by a coaxial observer is at the center of the entrance pupil. The corneal surface is irregular and the pupil is not aligned with the cornea. 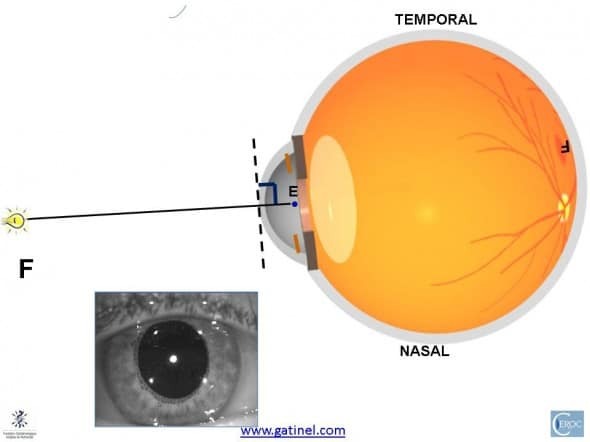 Hence, there is one pupillary axis which can be found by asking the patient to fixate monocularly (with the eye of interest) a non moving target, and display a bright point source of light until its reflection appears for an observer coaxial with the source located in the middle of the entrance pupil. The pupil axis serves to define the kappa and lambda angles. 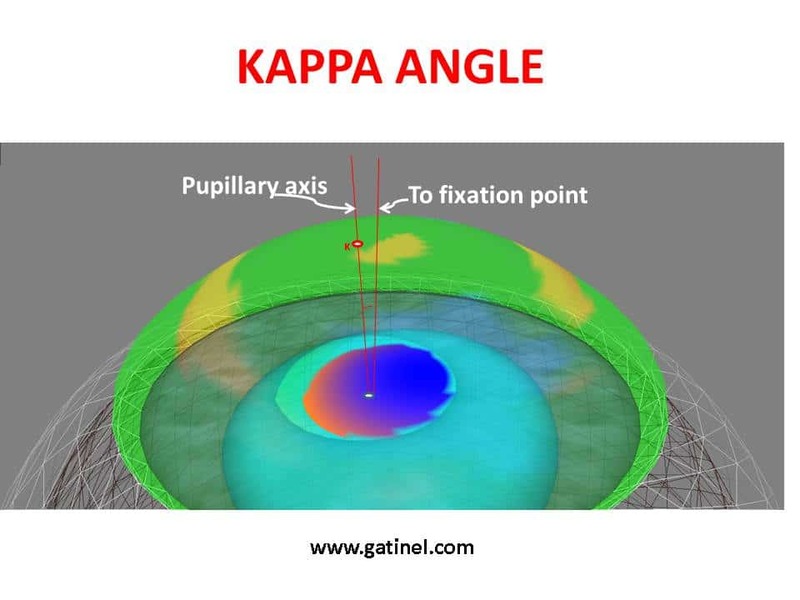 The kappa angle is defined as the angle between the pupil axis, and the visual axis; In some treaties, this angle is called angle « Lambda » (if so, angle Kappa labels the angle between the pupil axis and the line of sight). 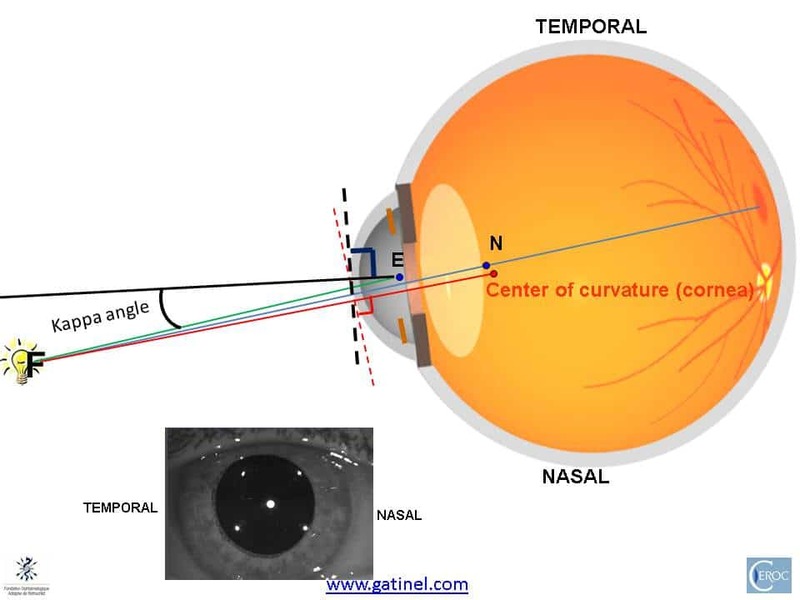 In practice, the values of kappa and lambda angles are very close: remember that the distance between the respective corneal intercepts of the line of sight and the visual axis is (despite clinical relevance) short (a few hundredth of a millimeter compared to the distance between these points and the corneal intercept of the pupil center. As this intercept location is not measured by clinical routine testing, The Orbscan instrument may be the only topographic device to provide an estimate of the true kapa angle, as this instrument is capable of measuring the distance from the cornea to the entrance pupil and locate its center. 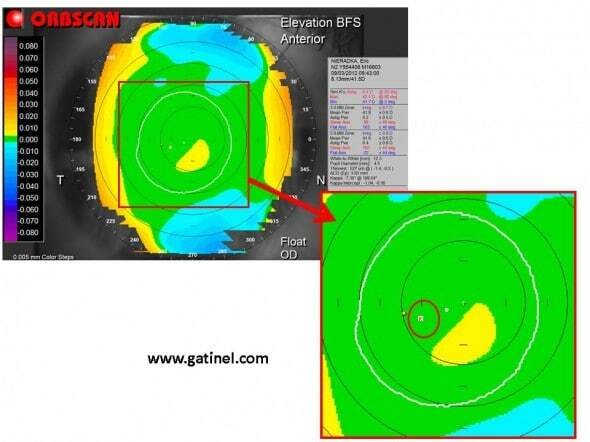 The intercept of the pupillary axis and the anterior corneal surface is shown (letter K). The pupillary axis pierces the cornea temporally to the intercept of the line of sight (the pupil is delineated in white, and its center marked as a white dot). The pupillary axis and the visual axis delimitate angle kappa; the larger this angle, the more the eye tend to « rotate » temporally while fixating. The pupillary axis is not necessarily located in the plane formed by the line of sight and fixation normal (line connecting the fixation target and the first Purkinje image i.e the reflection of the target by the corneal surface, not shown in the above diagram). Other pure specular Placido based topographers can only measure the curvature of the front surface of the cornea: from the distance between images of the vertex and of the center of the entrance pupil. This distance is sometimes improperly refered as the « kappa angle ». The reason for this (incorrect) assumption comes from the fact that the larger the Kappa angle, the larger the distance between the specular reflex of the coaxial fixation source and the center of the entrance pupil. 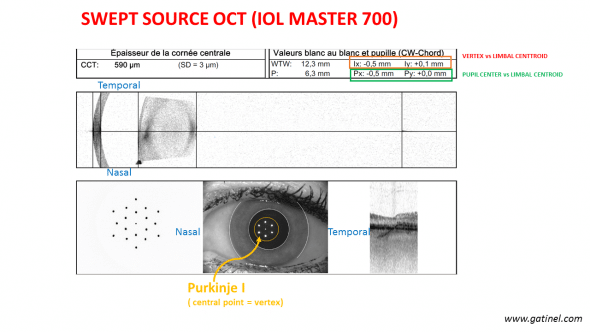 This is an example of the influence of the Kappa angle on the first Purnkinje image location (the camera of the IOLMaster 700 is coaxial with the center of the fixation mire which is used to calculate the keratometric power).